This very special and rare tea is made using tea leaves picked from aged wild Arbor tea trees that grow in the high Shi Zi Mountains of Wu Ding County. The tea leaves can only be picked once a year during the early spring season. 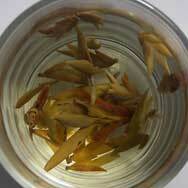 This and the fact that aged Arbor trees are limited in number make Ya Bao tea leaves very precious. It is not uncommon to find some Ya Bao tea leaves blended into tea cake. Usually, the Ya Bao leaves only cover part of the surface of the tea cake, which make up about 5% of the entire tea cake. Tea cakes compressed entirely of Ya Bao tea leaves exist, but they are very expensive and usually made on special pre-order. Ya Bao is known for its special cooling properties and regular consumption can help to lower blood pressure. 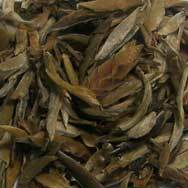 Unlike other Pu'er teas, Ya Bao tea leaves do not benefit much from aging and the age peaks at around 2-3 years old. It is ready for drinking now. Ya Bao taste is very special and unique. The aroma of this tea is full of flowery sweetness and a subtle hint of vanilla. It is unlike any other Pu'er teas that we have tasted before. The taste is flowery and has a pleasant rose-like sweetness. Exquisite. Don’t miss this. Some of the most beautiful bud=sets I have ever seen. Unique rose and citrus flavor, really exceptional. Not what I would think of as a puerh, much more refined. If you want to try something really new, this is it. Smoke, smoke and more smoke. Looking at the other positive comments about this, it may be that this 2007 batch has come to the end of its life. All I got was an overpowering smokyness and struggled to get any tea flavours. Half way through the second cup I had enough and couldn´t go on anymore. The aroma and apperance of leaves are realy drizzling, also - the same is with the taste. It is very sweet, it envokes it my mind memorials of early veral meadow, very floral and complex. 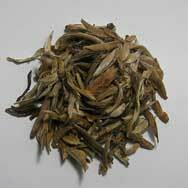 I give only 4, beacause once in my life I´ve drunk a better Ya Bao, more fresh and little more fragrant and floral... But this one is still excellent and I´m sincerely recommending it. Given quite reasonable preferences, there´s a lot to like about this tea. The tea brews quite a sweet liquid, so much so that I´m always reminded of roses and rosewater whenever I drink it. I don´t much appreciate such a flavor profile, but my aunt absolutely loves it. Overall, a good tea for the right taste buds. It was instant pleasure when I opened the bag to reveal the intact plant tips. However, sadly, I was unable to get this tea to really speak for itself. I tried a variety of methods (as recommend on the site and also western style). The soup is a cheerful, clear golden green/yellow. In the nose and taste I can barely sense fruitiness and detected a little cinnamon in the flavor (primarily first infusion). One of the most mild teas I´ve had, it is akin to seasoning hot water by the teas that previously inhabited the pot. If you like very mild teas, then perhaps this is for you. I find this tea at its best at 90C with little longer brewingtime. It is wonderful brewed right. Very good Geen Tea, I bought this simply due to the user reviews. They there correct this is a great Tea for all day drinking. This is my first pu-erh tea, and it´s very different from what I expected! The first surprise is the dry leaves. They are unlike any flat, rolled, or twisted leaves I´ve seen. They look like a bud-and-two-leaves system but multi-layered, solid, and bigger than any I have seen. The rose-like aroma mentioned on the website is definitely there, but what is absent is any sort of earthy smell one so often hears ascribed to pu-erhs. To be honest, this tea gives me the feeling of an herbal or scented tea (even though it´s not) and given the lack of reference point for comparison, I´m not sure how I feel about it. I will keep trying to see if what the tea offers. With a colour of 1st spring morning dew , and an aroma redolent of Silk Road journeys past and the fair young maidens met along the way. Round and round with a long spicy viscous finish. What a fantastic tea. Brews to a pale gold colour with a strong nose. The nose reminded me of roses and in the backgroung a slight pine needle scent. The taste is a full creamy roundness which fill the whole mouth. The taste lingers for about 20 minutes. This is totally different from any other Puerh I have ever tasted and I would recommend this tea to anyone. the second shipment for me. i love this tea get it when you can. this tea is really, really good. even smelling the dried tea leaves brought peace and clarity to my mind. this tea smells a bit musty (as it should), also with the smell of rose flowers. can infuse it many times. drinking this tea really took me someplace special. oh my god this tea is amazing. light fresh yet fruty and complex hint of appercott. the liqure is light yellow.